Regents Cry Foul, But Should They? Who’s responsible for approving the Pitino extension that multiplied his buyout by more than two times, to more than $8 million? The answer is extremely important to the story, and the mainstream media should do the work to report on it. Ultimately, this falls on the Board of Regents and the President’s office, but the details are important. 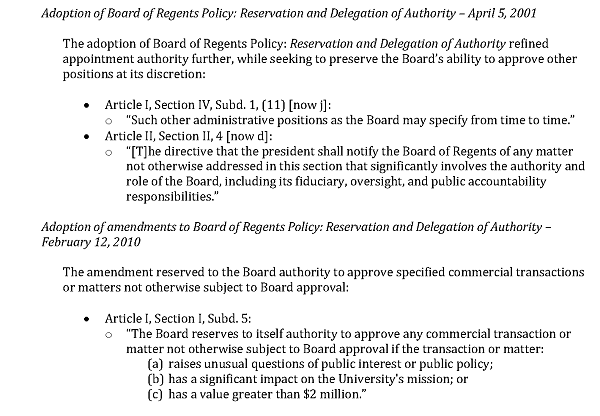 In March 2016, certain Regents became vocal and expressed frustration over Pitino’s large buyout (which at that time had amortized to just over $7 million). Some called for more oversight and ability to approve significant contracts. The reality, however, is that they already had the ability to do so. The Pitino contract situation illustrates the Board of Regents and President’s office not working well together. However, in the case of Pitino and the other contracts amended in reaction to the very public and shameful resignation of Norwood Teague, the Board should have been brought into the process under existing policy. In 1995, the ‘U’ removed head coach appointments from the list of positions requiring Board approval. Concerns were raised about the change, and thus the adopted amendment was very careful to state the Board, at its discretion, could review certain appointments. Further, the amendment placed an expectation that the President would bring to the Board’s attention significant matters that have University-wide implications, even though they are not required by the guidelines. In 2001 and 2010, there were further refinements related to the reservation of authority that the Board has. 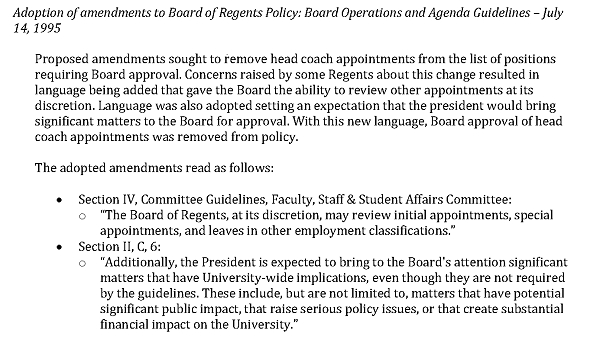 The President and his delegate, Chief of Staff Amy Phenix, should have – under existing resolutions – brought the matter of Pitino’s amendment to the Board. The question is: did they? On one hand, the Chairman of the Board expressed support for the Pitino extension shortly after it was announced. On the other hand, multiple other members of the Board seemed to indicate the large buyout was news to them in March 2016. Did President Kaler and Ms. Phenix consult with the Board prior to executing the amendments? Did they only consult with the Chair? Did he decline to update other members of the Board? Did the Board members fail to ask for more information? Did the President’s office fail to mention the substantial increase to Pitino’s buyout? These are the key questions that need answers in order to understand where the breakdown was, if there was one. Following release of an Association of Governing Boards of Universities and Colleges (AGB) report entitled, “Trust, Accountability, and Integrity: Board Responsibilities for Intercollegiate Athletics”, a review of athletics oversight practices at the University was initiated. This review was collaboratively undertaken by the Office of the President and the Office of the Board of Regents (BOR). The Board knew the best practice is to have oversight over the compensation, hiring and termination of revenue sport coaches, but they chose to not re-implement such oversight. The white paper states that, as of 2014, the President consults with the Board leadership before extending the contracts of revenue coaches. If requested, more information will be provided and a meeting setup if desired by the Board. Again, the questions around what the process was when Minnesota reacted to the resignation of Norwood Teague by amending multiple coaching contracts are of great importance. A valid question is whether the buyout is really that bad? There has been plenty of misreporting by mainstream media on the specifics of the buyout provisions. We’ll cover this topic in the future. And, finally… with regard to the “overuse” of funds for private jets in recruiting by Pitino. It must be realized that the evaluation periods for college coaches are limited (generally limited to four weekends in the spring/summer) and there are multiple events across the country going on at the same time. Games can and do start at 8 a.m. local time and last past 10 p.m. It is not uncommon for a coach to need to be in multiple cities not only over the course of one weekend, but also in one day. Relative to the total expenses of running a D-I basketball program, to not spend on private flights is doing an incredible disservice to a program and its university. If Pitino said, “hey boss, I think I might go over on the flight budget” and Teague said, “OK, whatever you need for travel expense to get it (recruiting) done, go for it!” then there is zero that folks should be complaining about.